We made it to the bus stop on time!!! What’s the big deal? Why all the exclamation marks? It’s not like I found the cure to any horrible disease, created a masterpiece that will go down in art history or restored peace in the Middle East. It’s pretty simple, really. Hazel made it to the bus stop on Monday morning and I feel good about it. I’ll be honest. It isn’t just that Hazel made it to the bus stop on time for the first day of school. It’s that she made it to the bus stop after a good night’s sleep, having eaten a good breakfast and with hair and teeth brushed. She was happy and I didn’t blow it with “put-on-shoes-did-you-get-everything-in-your-backpack-let’s-go-NOW!! !”, as I have been known to do. I was rested, got up early and did my yoga practice. She came in just before her wake up time and we snuggled on my mat for a few minutes before I asked her to get dressed and moving. I made her lunch. I only asked her to do one thing at a time. I knew this was an important day and I prepared myself so I could help prepare and support Hazel at the very start of her third grade school year. 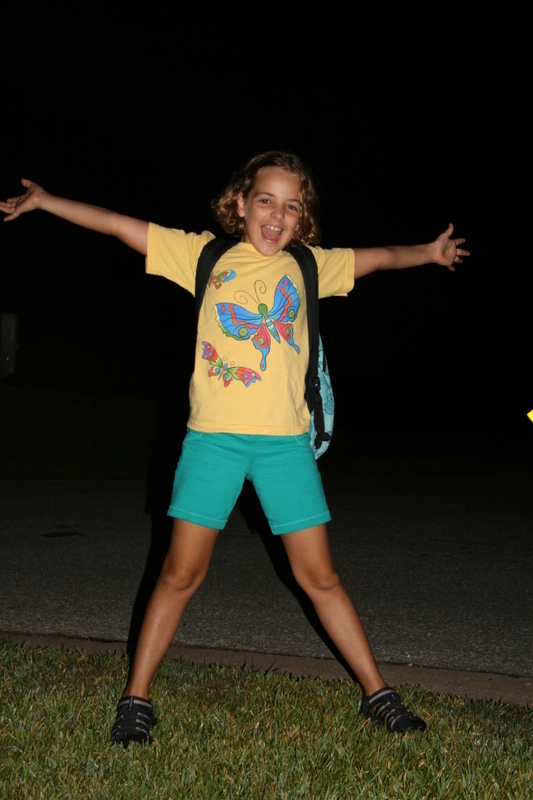 Check out that happy kid, at the bus stop, in the dark, and all ready for her first day of school. Getting Hazel to the bus stop didn’t begin with her early morning wake up. The night before, we ate, read stories, and brushed teeth a little earlier than usual. Last week, she needed time to talk about starting school, her new teacher, the old friends she would see and the new friends she’d make. I could see she was excited and nervous about school. She even cried a little because she didn’t want summer to end and because she was afraid that third grade was going to be way too hard. Knowing she’d even need all this began long before last week. When we practice asanas there is a starting point where we begin, just the same as for anything else in life. The starting point for this practice is the condition of our entire being at that present moment. It therefore helps to know as much as possible about our whole constitution so that we can advance step by step, developing our practice in accordance with our abilities. […]The concept of vinyasa krama tells us that it is not enough to simply take a step; that step needs to take us in the right direction and be made in the right way. I don’t feel like super-mama all the time. I yell, I’m distracted and I hustle my kids around plenty. Sometimes I wish I didn’t have to be mama at all and instead I could be world-traveler, woman who painted the most mind-blowing painting ever, or full-time dance and yoga workshop attendee. You may not know it by my early bed-time and my casual attire, but I also like glamour. Bus stops at 6:45am aren’t glamorous. So it’s a big deal that I am sometimes really able to slow down and tune into my sweet Hazel, embrace being mama, and then actually help create a bus stop moment like the one we had. I know how remarkable this kind of thing is for me. And then I look at all the other people doing it, too—the people who got their kids to school on time, ready and rested and excited, and I get teary and choked up about how wonderfully amazing we people are, showing up and doing the same thing again and again with very little glamour but just the right amount of thoughtful preparation, presence, and love. When we stay attune to the needs of our children and we do our best over days, weeks and years to set them up for success, that is nothing less that amazing. It’s amazing because it isn’t just getting our kid to the bus stop. It is vinyasa krama. It’s the stuff we do moment by moment that makes it possible for that kid to look out the bus window with a confident smile and a little wave as the bus drives away. We take good care of our children and in order to do so, we take good care of ourselves. We need to be rested, fed, and exercised to be able to listen well and maintain composure when shoes-aren’t-by-door-and-we-are-already-running-late (!!!). The spirit of “Please make sure to secure your own mask before helping others” applies to air travel and to this kind of amazing-ness, for sure. None of this gets announced via loud-speaker, written in a newspaper headline, or featured in Vogue magazine, but when it goes well, getting your kid to the bus stop is evidence of remarkable dedication, attunement and care. It is a beautiful achievement. And you know what? We all do this kind of thing day after day. Maybe you do this for your kids or maybe you offer care and support to your parents, a sister, a friend. Maybe you care for animals. Maybe you tend your garden. Maybe you take good care of your own needs very well. You make it to yoga class one time a week or you plan your menu so that you have a healthy diet that works for you. That preparation, listening and self-care is part of your amazing achievement. It’s a part of mine. Achievement isn’t always big and glamorous. Sometimes it happens with a special 8-year-old before 7:00am at the bus stop. < Previous Sometimes, I change my mind. Next > I don’t really want tacos. I want you to hold me tight. I need to explain something…no, I’ll go ahead and exclaim it— I do know my punctuation marks by name, I promise!!!!!! Thanks for your kind words. Raising kids is hard work and not always so lovely so why not give a little cheer when things go well?